Here’s the podcast of Friday’s Business Live radio show, first broadcast on Sheffield Live 93.2FM. 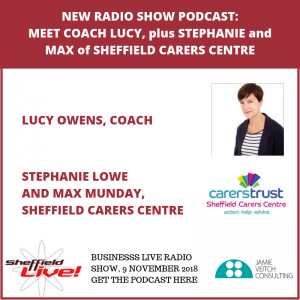 Studio guests were Stephanie Lowe and Max Munday of Sheffield Carers Centre, and Lucy Owens, a coach who helps people to thrive in their working lives. Steph and Max described the valuable and vital work of Sheffield Carers Centre and previewed the new Sheffield Carers Card, launching on 30 November. This will offer a variety of discounts and special offers to thousands of carers who are registered with Sheffield Carers Centre. Many businesses are already involved, supporting the card (and getting a business benefit in return). Steph and Max explained how, if you run a business or social enterprise active in Sheffield, you can too. Lucy Owens works with individuals and organisations to develop and maximise their potential. As a coach she specialises in 1-1 coaching, facilitation and management training. Lucy has previously worked as a journalist for BBC Radio Sheffield. We covered Lucy’s areas of work, with businesses and organisations, large and small, and with individuals. It was interesting to learn about the challenges that Lucy helps clients to address, how she does this, and how she supports a growth in their self-confidence. Lucy also described her process of working with clients to identify key priorities and goals and help them find realistic, pragmatic routes to get there; and her journey from BBC journalist to coach. It’s clear she does so with rigour and great integrity; she is committed to ongoing professional development and has her clients’ best interests at heart. So I also had to ask Lucy about the coaching business as a whole and whether its expansion has attracted folk who don’t necessarily have the integrity and skills their clients deserve. How has the franchising within coaching and its development affected an established coach like Lucy; how does she attract clients; and how should you choose a coach? If you run a business or social enterprise and would like to support and connect with 1000s of carers in Sheffield, contact Stephanie Lowe – contact details and more about the Carers Card are here.